On September 6th and 7th I joined my fellow editors of John Donne sermons and other scholars of early modern preaching at a conference on ‘Place and Preaching’ in St. Paul’s Cathedral. We heard papers on everything from the hangings in Il Duomo of Milan to the arrangements of pews in seventeenth–century Yorkshire, from mistakes that hearers make when preachers use Hebrew to the ways that preachers use quotations in Latin and Greek. Art Historians, Historians of the Reformation and Renaissance literary critics all featured on the programme: some very senior figures and some people still working on their PhD. In a field that is still quite new and often feels quite marginal within our disciplines (English Literature, History and Art History), there was a great sense of a shared project at this conference. I learned a great deal, and I swopped some useful references in return. 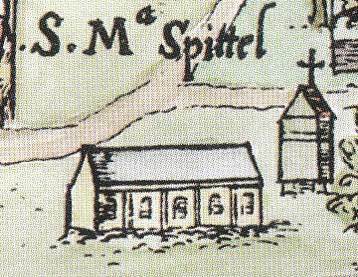 My own paper was on St Mary’s Spital, an outdoor pulpit near modern Spitalfields (you can still see the remains at 1 Bishop’s Square, E1 6AD). Every Easter, the Lord Mayor and Aldermen of London processed to this site in their best robes to hear famous preachers deliver a two-hour sermon. Also present were the orphans of Christ’s Hospital (now Christ’s Hospital school), the most vulnerable members of the citizen community. The children wore their blue coats and were seated in full view of the audience (so that contributors to the school could see where their money went!). The vividness of the scene (the aldermen in scarlet, the children in blue and the citizens in their black robes), is often mentioned, but we have no contemporary picture of it. I am currently working on a project to create a reconstruction of this event, which was a highlight in London’s civic culture in the early modern period. This entry was posted in Department of English Literature news and events and tagged Department of English, Department of English Literature, Dr Mary Morrissey, English Department, English Literature, John Donne, Reading, St Mary's Spital, St Paul's Cathedral, University of Reading. Bookmark the permalink.